How Does Steam Cleaning Tile and Grout Work? How long does the unit produce usable steam? By themselves, tiles can form striking floors that are durable and easily cleaned. But because the grout is porous and typically light-colored, over time it becomes slick with slime from soap, foods, and worse. With all the options on the market today, what is the best steam cleaner for grout and tile? In short, a quality multi-function canister style steam cleaner will be the most appropriate for the task of grout cleaning. Read on and we will highlight some tips and tricks, as well as our top picks for the best steam cleaner. Once too much mold and soap scum get embedded in the grout’s surface, oftentimes the only remedy is to remove and replace the filling. But then, why bother with a total redo, when such floors can be cleaned well from the very beginning? Steam cleaners give you the cleansing power of hot, high-pressure vapors anywhere around the house. It would be nice to know whether steaming provides a natural means of handling the gunk that builds up on tile floors, without resorting to hazardous chemicals. We review the merits of the method here and describe how it is done. Damp areas tend to develop a lot of offensive grime and growths. This cannot be helped much, for builders usually specify tiles wherever constant traffic in the wet is expected. Although tiles are impervious to elements such as water, the filling between each is hardly as robust. As scum seeps into the grouts pores over the years, it eventually toughens and becomes hard to remove via regular means. Even vigorous scouring with bristled brushes and strong detergents may not be enough. This is why cleaning such floors can be so tedious. Cleaning your floors 1-2 times per week is crucial to preventing buildups that are hard to clean. A pressurized steamer is very useful for handling such problems. Users who purchase a unit frequently spend their first day looking for surfaces that can be steam cleaned. The first that usually come to mind are in bathrooms or kitchens, for these are the places that are challenging to maintain. There are no consumer steamers that are specifically marketed for cleaning tiles and grout. Most designs normally comprise a wheeled base that contains the tank and boiler, along with a set of nozzles, hoses, and various attachments for the steam wand. Steam Cleaning grout has great results. The Dupray Tosca Steam cleaner is featured in this video. A steam cleaner works by getting its streams in-between the lines, dissolving gunk and blasting away the resulting sludge. The hot jets are produced by toggling a control switch on their handles. Good designs generate loads of steam with temperatures of some 200F and typically include brush attachments that assist in removing loosened gunk. Popular models such as McCulloch’s MC-1275 and Dupray’s Neat are built to continually spray large amounts of steam on demand. It is the mix of high heat, heavy misting, and pressurized steam generated by the boiler that jointly produces the cleansing effects. However, attached bristle brushes are still very useful in dislodging slime and stains that hold fast. A filling flask or funnel for refilling the steam cleaner if it did not come with one. Before attaching accessories, steam blast the grout first so as to dissolve the nastiest crud. Then attach smaller brushes to the wand as you continue to steam along the lines. You only need to direct the nozzles along problematic areas. If your steam cleaner has good steam pressure, I found that that steaming grout in corners, like in a shower, the steam can get very loud, much like a high whistling noise. Ear plugs may be a good idea here. Begin by using any included nylon-bristled brush, for the type will not cause chipping no matter how much you scour. Most steam cleaners come with both nylon and metal brushes so be sure to pick the correct one! Scrub lightly as you go and the loosened gunk should get lifted readily enough. Be careful when using wire bristles, these can chip grout and scratch tiles forcing you to possible replace your grout. Remember to wipe up cleaned areas every few minutes so as to soak up the sludge. Otherwise, the stuff will eventually harden and complicate the job. Be aware that steam cleaning usually has to be supplemented by vigorous scrubbing, as steaming on its own does not clean off everything. After finishing a space, give the unit sufficient time to build up another head of steam. Most consumer models also need an initial warm-up time. There are some important functions and features to look for in a steam cleaner. One of the most important things is picking a steamer from a respectable brand. There are a lot of cheap steam cleaners out on the market with brand names you likely never heard of. I would advise steering clear of these as you normally get what you pay for. The bigger brands such as Dupray, Bissell, Wagner, etc. offer good warranties and excellent customer support if needed. One of the most important attachments when steam cleaning grout, is the nylon brush. The nylon brush allows steam to flow out through the center of the brush and provides the right amount of scrubbing power. Do not confuse this brush with the metal brush! The metal brush will be too tough and could end up scratching your grout and tile. You may also want to take into consideration what other things you might plan on cleaning with the steamer and plan your purchase accordingly. Many multipurpose canister cleaners come with 12-18 piece accessory kits that include floor mops, squeegees, extension hoses, corner brushes, carpet gliders, to name a few. Most of the steam cleaners on the market today are not continuous operation steamers, meaning you’ll have to let the unit cool off before refilling, then wait again for the unit to heat back up. When steam cleaning grout, it’s likely that you’ll have a large area to clean and will need multiple refills, adding significant time to the job. Size matters – Get a steam cleaner with a large tank, or, one that has a variable steam control. This allows you to turn down the steam pressure if you don’t need it, extending the steam time of your cleaner. As mentioned earlier, the steam time of the unit is a big feature of most steam cleaners. This is usually clearly listed as the main feature since it’s so important. For big jobs such as grout cleaning, this should be near the top of your criteria for choosing the best steam cleaner to fit your needs. A good manufactures warranty can be invaluable for something like a steam cleaner. This is where picking a steamer from a reputable brand is important. For example, Dupray’s warranty is 3 year on parts and lifetime on the boiler. If your machine breaks within 3 years, they will issue a replacement of equal value or potentially an upgraded model. Another option and perk when buying on Amazon are their affordable extended warranties. You can purchase these warranties for an additional piece of mind knowing that a replacement will be provided by Amazon hassle free. These warranties vary in cost and length based on the item purchased. There’s many different options available when buying a steam cleaner. The goal of the next section is to show you some of our picks based on brand recognition, quality, and functionality. The Dupray Neat is a newer model from Dupray and is aimed at consumers looking for a quality built steam cleaner at a reasonable price. They’ve done just that! This thing is getting great reviews on Amazon! The steam cleaner is pretty compact in size and weighs about 9 lbs. It has a retractable handle and extension cord storage underneath. You should have no issues getting to all the spots you need to with this machine. It features a 6′ 6” hose, a 16′ power cord, and if that’s not enough, it’s got wheels too so it will move freely if needed. Our next pick is from SteamFast and is the SF-370WH multipurpose steam cleaner. Much like the Dupray Neat, this steamer has great reviews on Amazon. It has pretty much everything you’ll need to clean your grout along with many other things. The SF-370 comes at a slightly lower price point than the Dupray (at the time I’m writing this) but still has many of the same features and specs. The SteamFast has a slightly lower steam time due to a smaller tank. It also has fewer attachments. The warranty from SteamFast is only 1 year so definitely not as good as Dupray’s. Still a solid steamer for the price. Keep in mind they have a Deluxe model that is more comparable to the Neat. You may be familiar with Wagner as making products for painting, at least that’s what I think of when I hear Wagner. 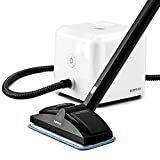 Well, they make a steam cleaner as well, and it’s a pretty good one! The Wagner SprayTech 915 is a good steam cleaner built for a purpose. 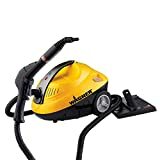 Handheld steam cleaners definitely lack the cleaning power of the canister type cleaners above but they still maintain their place in the market. These light and versatile steamers offer good cleaning power for lighter jobs and daily chores. The Bissell Steam Shot is our handheld steam cleaner top choice. This steam cleaner provides excellent value and plenty of accessories to tackle most jobs you’ll find in the home. 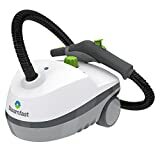 Buying from a name brand such as Bissell is usually a good idea, to begin with, and I’m happy to report that this steamer doesn’t disappoint! A powerful 1000 watt power rating and 20 ft power cord will provide the best power wherever you need it. What good is all that power without the right attachments? Well, the Steam Shot has you covered there with a 9 piece accessory kit. Bissell’s one year warranty should be OK for a steamer like this. For additional piece of mind, you can always opt for 2 or 3-year protection plan for just a few extra bucks when you purchase on Amazon. Here’s another one from Bissell that is quite unique and there’s currently nothing out there like it. This handheld steam cleaner comes with some standard attachments. Where it shines is the extension wand that turns this into a steam mop. Yes, there are steam mops that have lift away handheld steamers, but it’s still a steam mop. This is a handheld with a simple, slim, attachment to go from handheld to steam mop. Aside from the cool extension wand, one of the big perks of this unit is the above average take size for a handheld of 12 oz. 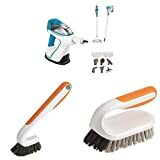 There are several package options available on Amazon, all closely priced, including extra steam mop pads and cleaner, or a grout and bath pack with 2 extra scrubbing brushes. The Vapamore MR-75 Amico steam cleaner makes our top 3 for two key reasons. It comes with a limited lifetime warranty (doesn’t cover normal wear) and comes with an above average number of attachments, 16 to be exact. The Amico has good power for a handheld steam cleaner and with the help of the many attachments, you shouldn’t have an issue steaming most tasks in the home. One big downside to this unit is the short power cord. At 10 ft. in length, it’s well short of its competitors. This is a DIY job where you use a household steam cleaner to direct streams of high-temperature steam at slimy and stained grout. You will still need to carefully scrub the toughest stains, though. Steam cleaning tiled floors and grout is a moderate option for most homeowners. Although it involves more effort than scrubbing by hand with water and detergents alone, it is less costly and quicker and easier to do than tile and grout replacement. A versatile canister model is probably your best bet. They work well for grout and tile, but come with many accessories so you can clean much, much more. Remember to maintain your floors regularly and avoid letting heavy dirt and grime settle into your grout in the first place.